﻿Solemnity of Mary: Calendar, History, Tweets, Facts, Quotes & Activities. The Solemnity of Mary acknowledges and celebrates Mary's role as the mother of Jesus Christ.The Roman Catholic Church considers it a holy day of obligation. This means that Catholics are obligated to attend mass. The Solemnity of Mary is also called the Octave of Christmas. An octave marks eight days after the significant Christian events of Christmas and Easter. These holidays are celebrated for a week, with the octave marking the last day. A solemnity is the highest-ranking feast days in the Roman Catholic Church. Other solemnities include Sundays during the season of Lent, Easter, and Advent, and every day of Holy Week leading up Easter. Come, Holy Spirit, Creator blest, and in our souls take up Thy rest; come with Thy grace and heavenly aid to fill the hearts which Thou hast made. 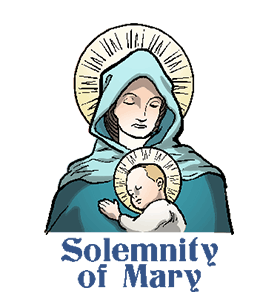 The Solemnity of Mary was at one time part of three feasts on January 1. They included the octave of the Lord, a recap of Christmas, and the Circumcision of the Lord. Many Catholics believe that the blood baby Jesus shed on his circumcision day was the beginning of his ministry as Redeemer. Roman Catholics, as opposed to Protestant Christians, elevate the role of Mary as integral in their salvation because without her bearing the Child of God there wouldn't have been a crucifixion and resurrection. When the angel Gabriel arrives to tell Mary what God has planned for her, she is confused. Her faith leads her to say "Let it be." (Luke 1:26-38). In Roman Catholicism, Mary is referred to as the Queen of Peace, since the Messiah is referred to as the Prince of Peace (Isaiah 9:6). The Solemnity of Mary is also World Day of Prayer for Peace in the Catholic Church. Attend the Solemnity of Mary Mass at a Catholic Church to learn more about Mary and their beliefs about her role in Christian Salvation. Lord, make me an instrument of Your peace. Where there is hatred, let me sow love; where there is injury, pardon; where there is doubt, faith; where there is despair, hope; where there is darkness, light; where there is sadness, joy. O, Divine Master, grant that I may not so much seek to be consoled as to console; to be understood as to understand; to be loved as to love; For it is in giving that we receive; it is in pardoning that we are pardoned; it is in dying that we are born again to eternal life. Rent a movie that reflects on the life of Mary or promotes peace. Our picks include Mary, Mother of Jesus (1999), How to Start a Revolution (2012), Gandhi (1982), Dead Man Walking (1995) and Witness (1985). Study how Mary's role has changed in the Roman Catholic Church. Pope Pius VII wrote about the dogma concerning the assumption of Mary in 1950. The belief proclaims that Mary didn't die but ascended into heaven like Christ did after his resurrection. Mary's assumption doesn't appear in scripture, but is referred to in early church writings. This dogma is a major theological difference between the Roman Catholic Church and Protestant denominations.